I never managed to get an accurate count of our staff, or even understand fully their hierarchy and organization. I know there was a set of porters and kitchen helpers, outfitted in brand new identical yellow and blue parkas by Ice Land. There were three groups of Yaks, each tended by a herder. And there were a couple of cooks, in charge of the meals. I could never tell for sure if the porters participated in preparing the food, or if that was a special subset of the staff. While we were resting in our tents, the staff was usually busy cooking, or perhaps just hanging out near the cooking tent where it was a little warmer. At night they crowded into one or two small tents, huddled together to keep warm. Some of the porters did not have proper footwear: light canvas sneakers or even flimsy flip-flops. They must have been cold, but I never saw any complaining. They must have been tired, but I never saw any slacking. They were quiet, attentive, and always ready to be helpful. 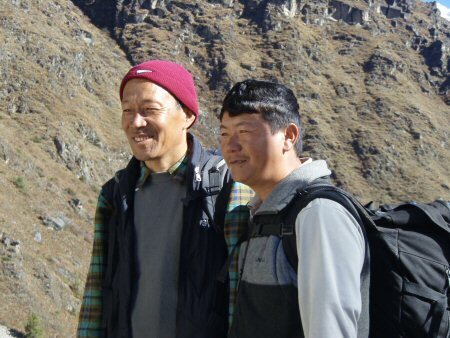 Then there were the sherpas: they hiked with us on the trail, carrying only their own baggage. Many of these had been porters in previous years, graduating perhaps because of their facility with English. There was a hierarchy of sherpas: at the top was Purba, who seemed to be in overall charge of everything. 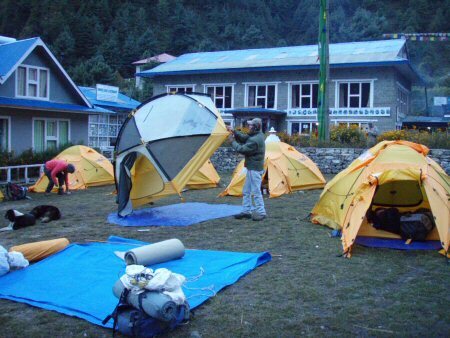 Our sherpas also set up and took down the tents, handled the baggage every day, and served all the meals.